Hello, hello I hope you had a great 4th of July, grilling and celebrating. Ours was kind of quiet, we grilled on a Sunday and had a very relaxing situation. I have three things to say about this aioli, Make it today! No excuses no apologies, once you try this creamy, velvety aioli you are gonna fall in love. I used this Saffron garlic Aioli as complement, that works more like an accent on my Sweet Corn Crab Cakes recipe. Also it works great on: Grilled vegetables, smother some on grilled corn on the cob, shrimp, grilled salmon, any fish, fish fillet, fish tacos, calamari, octopus, pasta salad, hamburgers, grilled chicken, poached eggs, sandwiches, crostinis, tomato salad, COLESLAW!, toss a bit of this bright yellow aioli on your deviled eggs, on a green salad, on your old shoes, your arm, forehead, cherry tomatoes, … I’m telling you this Saffron Garlic Aioli is the bomb!…The Saffron flavor shines, with a floral, smokey and bright yellow tint in combination with the garlic sharpness. 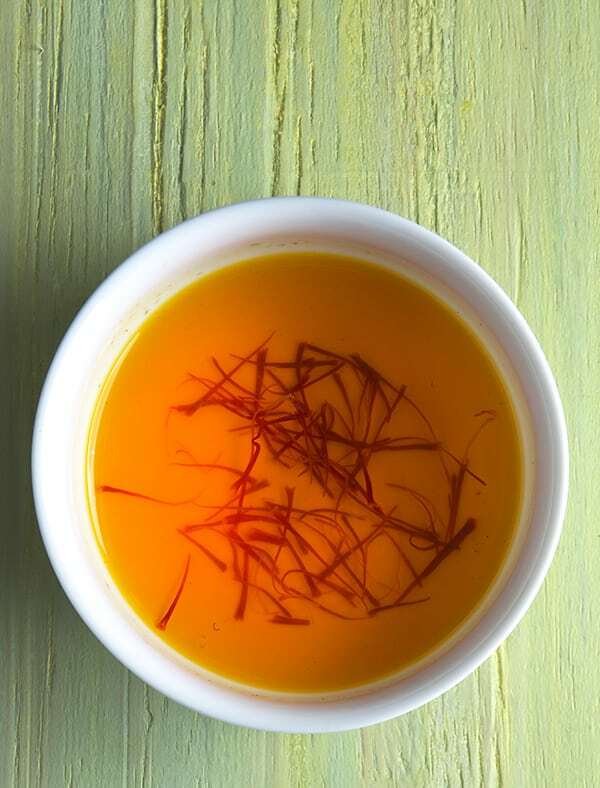 A tangy note from the vinegar, and its incredible creaminess is what makes this aioli irresistible. Transatlantic ingredients = BIG bold flavors give it a shot what else is there to ask for this will make you crave your vegetables in such a way that should be illegal. 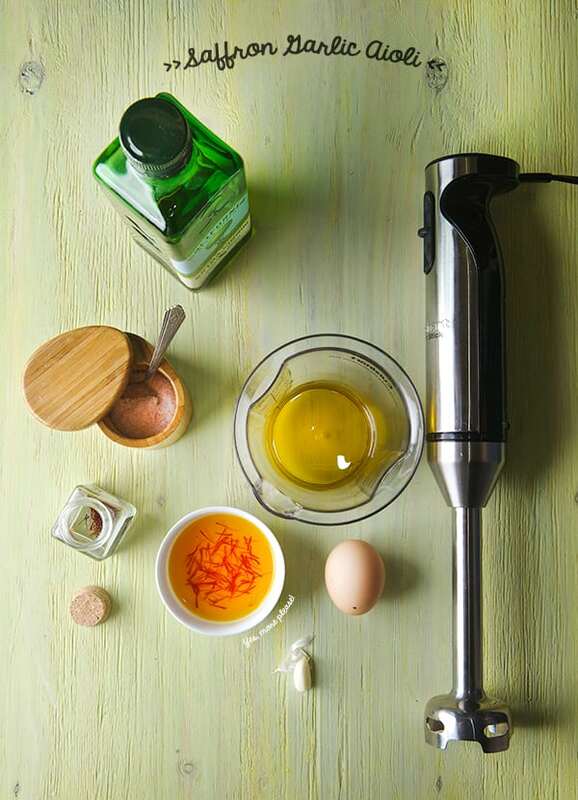 You will need just 5 ingredients, 10 minutes, and an immersion blender… then you are hooked! With no more to say, Enjoy. 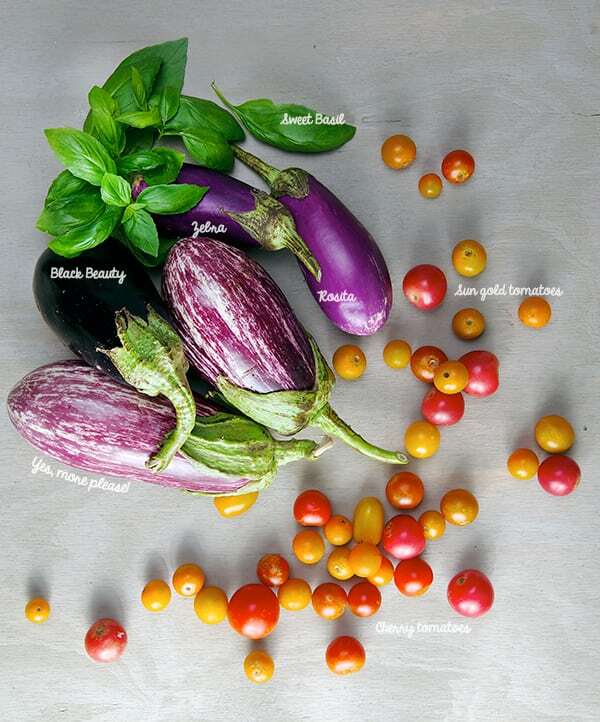 The first days of summer are arriving in Texas, and with them an incredible vegetable abundance. With this memory of flavors in mind, I started to think of how could I transform a classic into a more simple and Summery version. 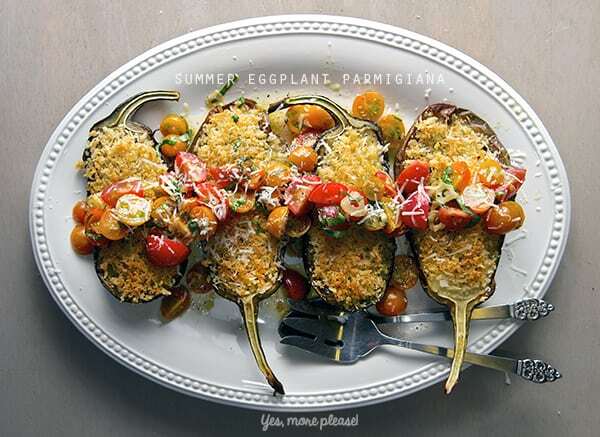 I came up with this Summery eggplant parmigiana recipe. A lighter version in which instead of breading and frying the eggplant I cut them lengthwise and roast them in the oven. 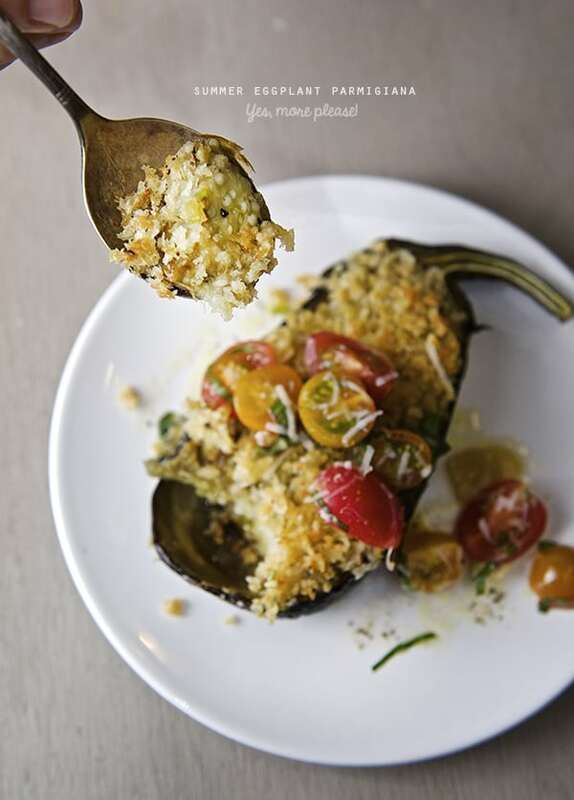 Eggplants when roasted this way, develop a buttery flavor almost like a vegetable custard contained in it’s own skin. That’s why Im skipping the melted cheese on these recipe. Believe me you have to try them, you will be enjoying the delicate eggplant flavor. To add texture and contrast to this custard I added a combination of panko bread crumbs and Parmigiano-Reggiano cheese. If you have a gluten allergy these can easily be replaced with ground pecans,or almonds instead of panko breadcrumbs which it will be equally or even more delicious. Instead of the warm marinara sauce, I made a warm tomato salad with a garlic oil dressing combining the first sweetest cherry and sun gold tomatoes of the tomato season. These little tomato marbles are incredibly flavorful, I never feel like cook them I almost eat them like grapes, as a snack in the afternoon. That’s one of the reasons this simple warm salad enhance their great qualities. 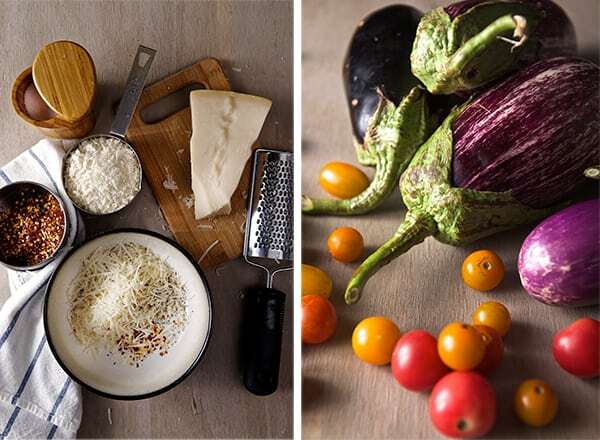 This summer eggplant parmigiana version will warm your heart. It is easy to make, light, and comforting. Welcome to the summer, and enjoy! ½ cup Parmigiano-Reggiano cheese grated. 2-3 teaspoons of extra virgin olive oil. fresh cracked black pepper to taste. 2 cups of a combination of cherry and sun gold tomatoes. 3 tablespoons Seasoned Rice Vinegar. salt and fresh black pepper to taste. 2. 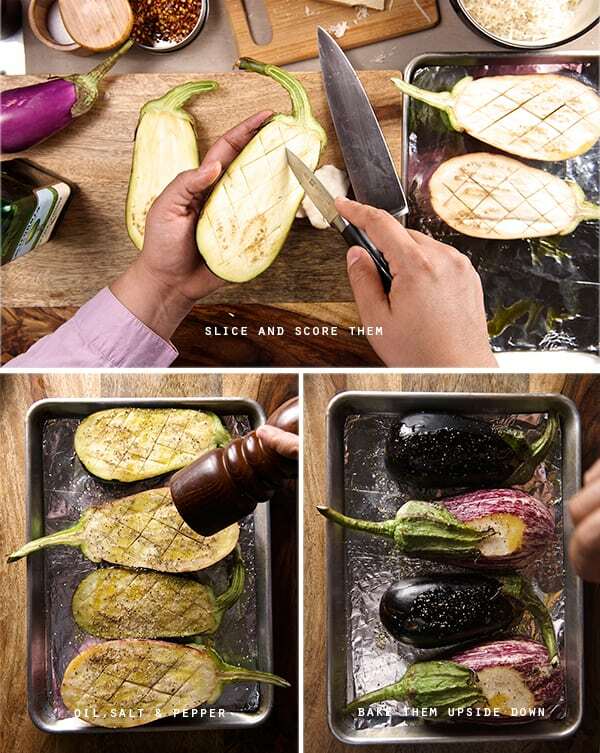 Cut the eggplants length wise and score them with a pairing knife.Rub the eggplants with some olive oil or grape seed oil, season them with salt and fresh cracked black pepper. 3. 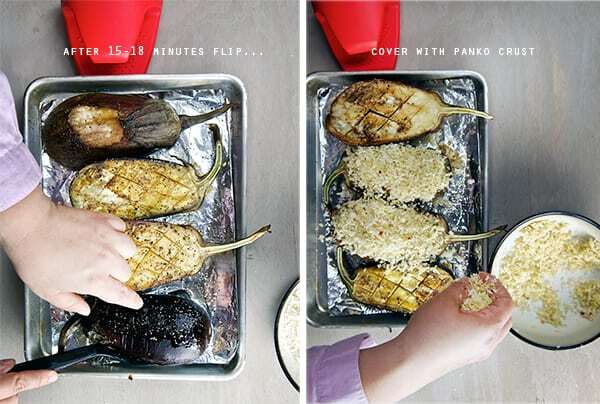 Place the eggplants on a baking sheet and roast them for about 15-18 minutes. 4. Mean time, in a bowl combine the Panko bread crumbs, grated Parmigiano-Reggiano cheese, red pepper flakes, olive oil, salt and pepper until well combined and the mixture resembles moist sand. Set a side. 5. 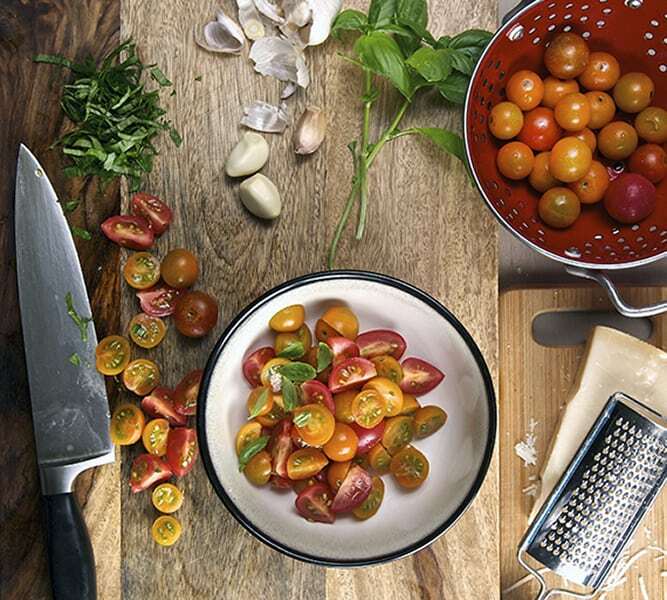 Start making the warm tomato salad, by cutting the cherry and sun gold tomatoes into halves or quarters depending on size. Chifonade the basil. Combine them in a bowl, toss them with the rice vinegar, salt and pepper. 6. In a small pot add the extra virgin olive oil along with the thinly sliced garlic and using the lowest possible heat on the stove, start warming up the oil. This will infuse the oil with the garlic and the thin slices of garlics will start turning golden brown. 7. 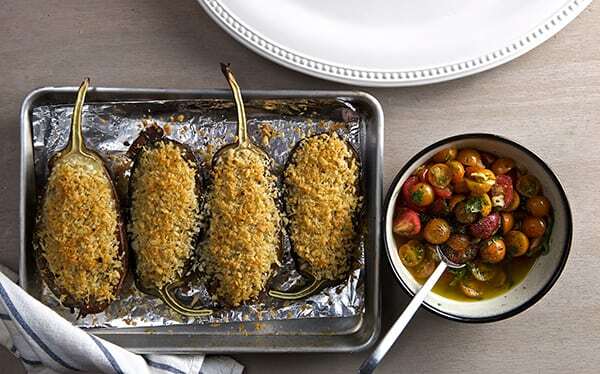 Check your Eggplant, take out of the oven top each half with a generous amount of the panko mixture. Place them into the oven for another 5 minutes until the topping is golden brown. 8. Mean time check your garlic and olive oil. Once the eggplants come out of the oven, remove the warm oil from the stove and add this to the cherry and sun gold tomato salad toss well. 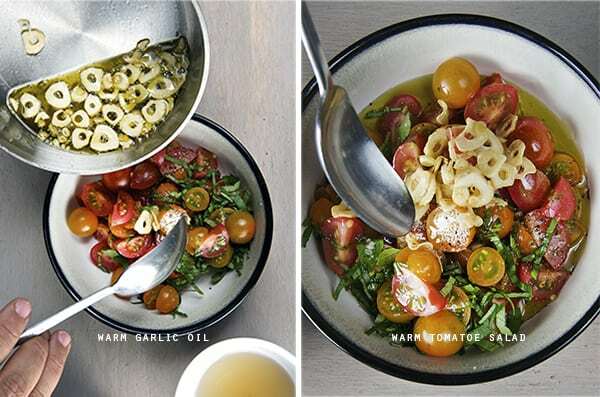 The warm oil will gently warm up the tomatoes,the garlic chips will add flavor and aroma to the tomato salad it is a fantastic! 9. 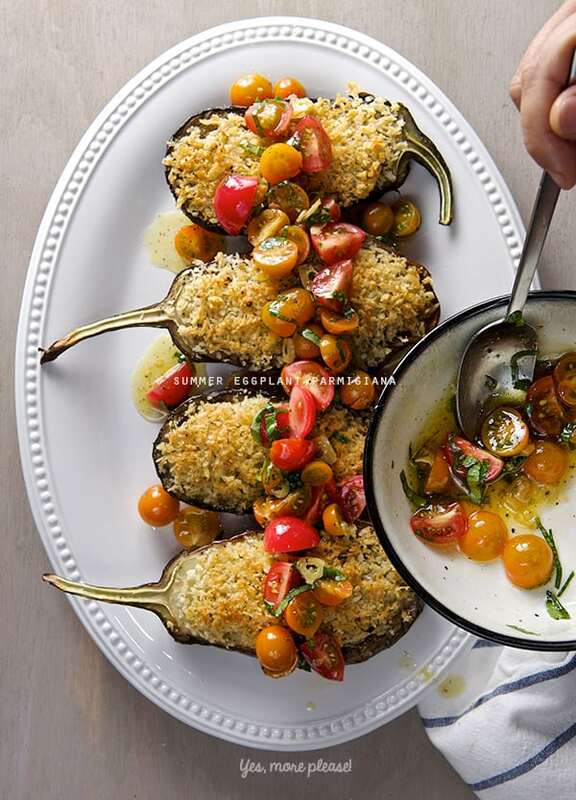 Once your eggplants are ready out of the oven transfer them onto a platter, and top with the warm tomato salad, grate a little extra Parmigiano-Reggiano and fresh basil. Enjoy! Hands down.. (heheh and fingers also) this kind of potatoes are in my top recipes list. 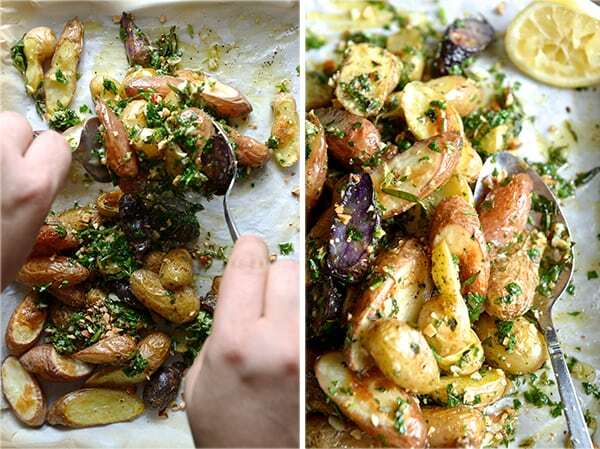 Fingerling potatoes are a family of heritage potatoes that naturally grown much smaller than conventional potatoes. You will find them in season for Fall and they can also be grown at home, in temperate climates. They have an elongated and a slightly knobbly shape, that resembles fingers. 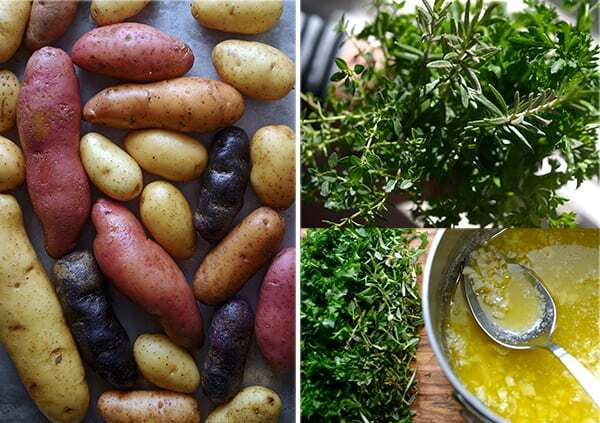 These little potatoes are extremely flavorful, they are waxy , starchy and colorful, from creamy white, orange to rich purple. 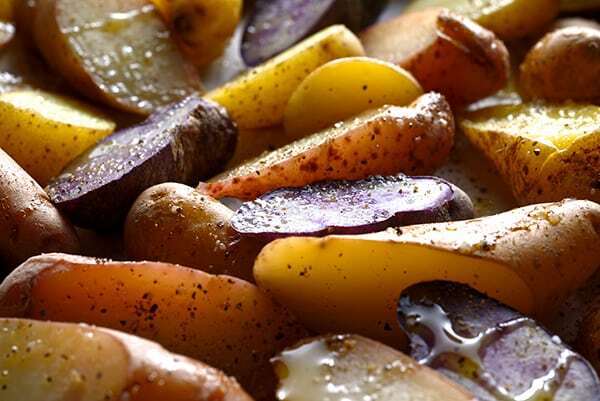 They can be used just like regular potatoes in an assortment of roasted, broiled, baked, grilled, or boiled dishes. What makes them so special is their texture; they are creamy and starchy but waxy and have a rich earthiness, especially the purple ones. I love the skin when you roast them, it becomes crispy and the inside creamy and tender. 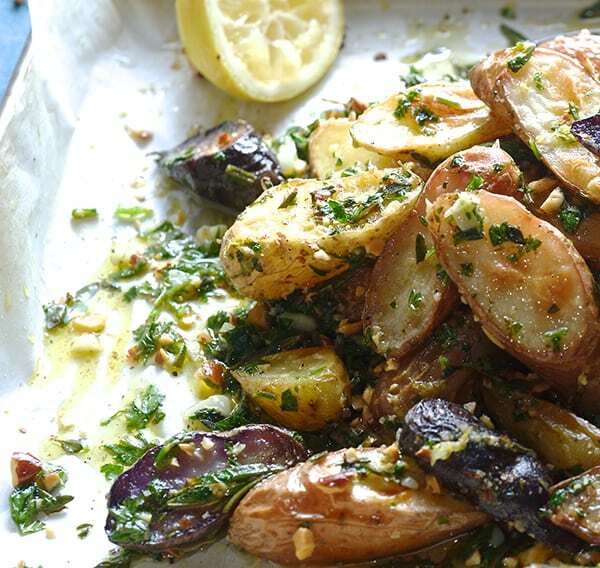 This recipe, combines the roasted potato, the herbed garlic butter with the toasted almonds that give an extra crunch. 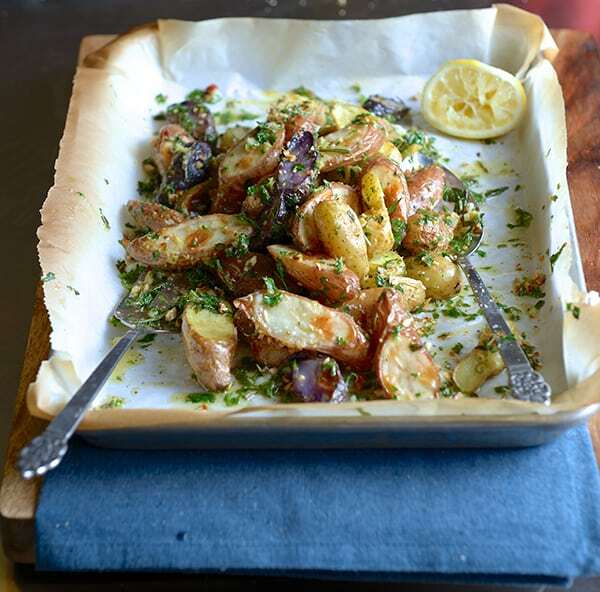 For me is all about the texture and flavor contrast, creamy-roasted potato skin, salty, buttery and lemony, herb-garlic and the nutty crunch, that makes this potatoes the bomb! 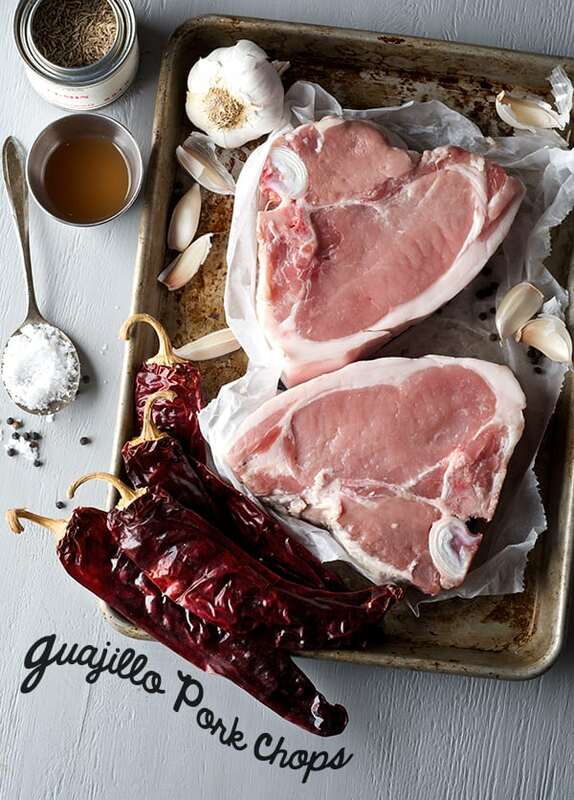 They cook pretty fast and they can be a show stopper for your Thanksgiving dinner… or any other special meal. Because of their shape I frequently serve them as an appetizer. They taste good warm or at room temperature… you will be licking your fingers after tasting this recipe! Serves 6 … or many more if served as an appetizer. 3 rosemary sprigs remove leaves from sprig and roughly chop. 4 thyme sprigs remove leaves from sprig and roughly chop. the zest of one lemon and the juice of half. In a medium size pot, parboil the potatoes for about 5 minutes. Drain them, and cut the bigger potatoes on a bias. In a separate small pot, melt the butter add the garlic and heat for about 1 minute. Add chopped herbs and let stand at room temperature. 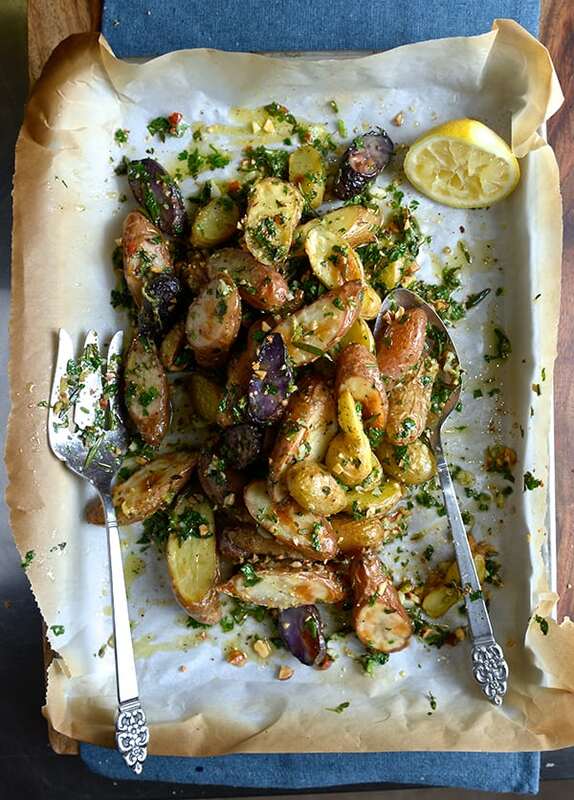 Place the potatoes on a baking sheet lined with aluminum foil, drizzle with olive oil, salt, and pepper. Roast them for about 20-25 minute. Check for doneness. 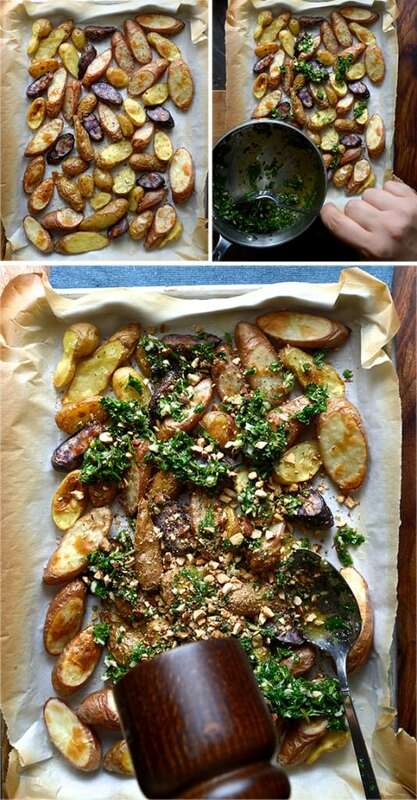 Once they are fork tender and show some color from roasting, remove from oven and drizzle the butter and herb mixture. Toss well and pop them back in the oven for about 3-4 more minutes. Pull them out of the oven and sprinkle the chopped almonds, zest and drizzle with lemon.